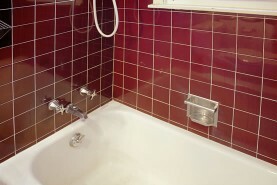 Painting Ceramic Tile -- Are you thinking about painting your tile? 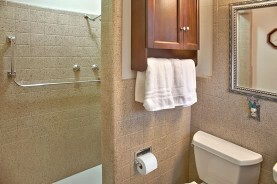 Are you considering painting ceramic tile in your bathroom? Do you have questions about whether ceramic tiles can be painted, reglazed, or refinished? All of these terms, tile painting, tile reglazing and refinishing, refer to applying some kind of paint or coating, but certain materials and procedures work better than others. Tile comes in all sorts of sizes and shapes. Tile is made by mixing clay and other natural materials and then firing it in a kiln at very high temperatures. Most ceramic and porcelain tiles have an additional glaze applied to them before firing. It is this process, tile glazing, that creates the tile’s smooth, durable finish. Technically, tile cannot be “reglazed” as this would involve re-firing each piece of tile in a kiln. This is totally impractical and unaffordable when the tile is already on your wall, countertop or vanity! Miracle Method tile refinishing - results can be dramatic! Painting Ceramic Tile – Is painting tile an alternative to replacement? Painting ceramic tile is an excellent alternative to replacement since true bath tile “reglazing” can only be done in a kiln. 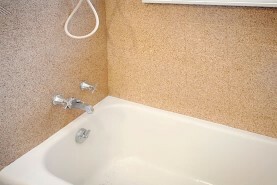 Ceramic tile countertops, showers, and vanities are all candidates for refinishing. However, it is very important to understand the differences between tile painting using traditional enamel paints and epoxies versus high tech coatings developed for tile refinishing. Spray can paints, enamels and epoxies are not appropriate tile paint. True ceramic tile paint or acrylic coatings are designed for this use and are best applied to a properly cleaned, bonded and primed surface with a high volume, low pressure sprayer by a professional refinisher. Miracle Method technicians have all been trained and certified to do tile refinishing. Ceramic tile refinishing has become more popular, especially with Miracle Method’s introduction of Natural Accents, an incredibly durable stone finish that can be applied to ceramic tile countertops, tile walls and even tile floors. A whole new look at a fraction of the price! Painting Ceramic Tile – What should you consider before tile painting? If you are considering painting ceramic tile, consider the use it will receive. All tile countertops are subject to wear and moisture. Miracle Method always applies a clear coat to horizontal tile surfaces refinished with our Natural Accents stone look. This hard clear coat protects the surface from scratching and moisture. It makes tile countertops easy to clean and stain resistant. You have the choice of satin, semi-gloss or gloss clear coats. Ceramic tile paint on vertical surfaces usually does not require a clear coat. The coating itself will seal the grout and protect it from moisture. Once sealed in the refinishing process, tile grout repair will no longer be needed and the grout will be completely sealed. 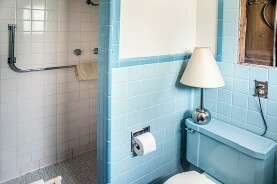 Painting Ceramic Tile - Why should I call a professional? If you’re looking for information on painting ceramic tile, our suggestion is to find a professional to do it. Painting ceramic tile is not a DIY project if you want factory-like results. If your home improvement store sells tile paint, you’ll find a very limited color selection. In addition, using rollers, brushes, or even a spray can will deliver disappointing results. Tiles that are painted with simple enamels will not look as good as professionally refinished tile. They will not last as long as refinished tile. And they will not feel like refinished tile. Epoxies tend to yellow and become chalky over time, so they are not recommended. To get the best results consider calling your local Miracle Method office for a free estimate. You’ll find a wide selection of colors and textures, including our Natural Accents stone finishes. You'll be much happier with the end result and you’ll save money over replacement as well. Painting Ceramic Tile – How to select a professional refinisher? Painting ceramic tile on walls, showers, vanities, and floors is a great makeover solution if it is done with the right materials, techniques and by a professional. However, not all refinishers are the same. Before you choose a refinisher to refinish your bath or kitchen tile, compare what you get with a professional Miracle Method refinisher! Miracle Method has been in business for nearly 30 years. We require our franchisees to attend standardized training and to adhere to defined quality standards. Independent refinishers are accountable to no one. A professional bathtub refinisher should be able to provide helpful information about his process and what you should expect the finished job to look like. Does he offer videos or a website to help you through the decision process? Does he have professional brochures and marketing materials? Do his workers wear uniforms and drive vehicles featuring the company's name? You should always ask for references. Check out the Better Business Bureau, Angie’s List or better yet, read the reviews from actual Miracle Method customers on our website home page. Click on Find a Location or call our toll free locator number, 1-888-271-7690, to reach the nearest Miracle Method professional and ask for a free estimate.